Paige Airport Parking is a family owned, established quality park and ride service at Luton Airport. The two brothers Christian and Andrew had the idea 5 years ago to setup the service due to the lack of other quality off-site park & ride services at Luton Airport. Since they first opened, more than 10,000 Looking4Parking customers have parked there with almost no complaints and fantastic reviews due to the excellent service Paige Parking provides. The car park was awarded the coveted Park Mark award shortly after it opened which means that it has been inspected and approved by the Police and the British Parking Association and is respected as a safe, secure and good quality well run airport car park. At Luton Paige Parking - Park & Ride everything is taken care of from the moment you arrive. You will drive through the automated barrier at the entrance, in full view of the state of the art CCTV system and then you'll drive forward into the arrivals area. Your car will be parked in a safe and secure area within the car park's secure parameter and there will be someone to assist you 24 hours a day from the on site reception. If you have any questions on the day our customer service team are also available 24 hours a day. The location of the car park couldn't be easier, situated just 5 minutes from the M1 at junction 10 and only 10 minutes from the airport on average. The shuttle buses are all brand new Mercedes mini-buses providing a comfortable and relaxing experience to and from the airport, leather seats, air con and a friendly driver come as part of the journey. The transfers normally take on average 10 minutes, depending on traffic. During peak time it may take a little longer. Please note that Paige Parking is unable to accommodate bookings that exceed 5 passengers per car for Airport transfer. Your vehicle will undergo a condition check before being parked. Any significant damage will be recorded and photographed prior to any movement. 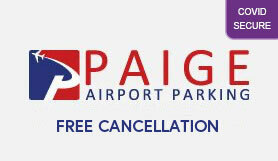 Please be advised that Paige Parking are unable to accommodate bookings that exceed 5 passengers for Airport transfer.